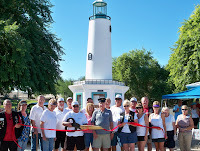 The Lake Havasu Area Chamber of Commerce Ambassadors held a ribbon cutting for the dedication of the Lighthouse Club’s 21st lighthouse at London Bridge Beach. The lighthouse will be used not only for navigational purposes but also as an information kiosk. The event is the club’s ninth lighthouse dedication during the City’s annual London Bridge Days. The Lighthouse Club also celebrates their 11th year as Chamber members. For more information contact Bob Keller, club President at (928) 764-1699.